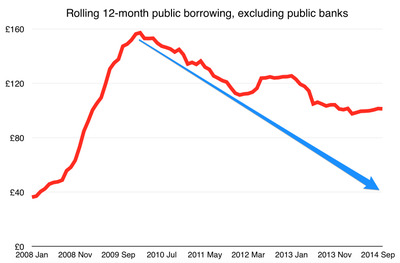 ONS, Business InsiderWhat actually happened to government borrowing (red) and what would have happened if it stuck to its original trajectory (blue). Click to enlarge. The latest UK public finance figures are just out, and they’re not pretty. 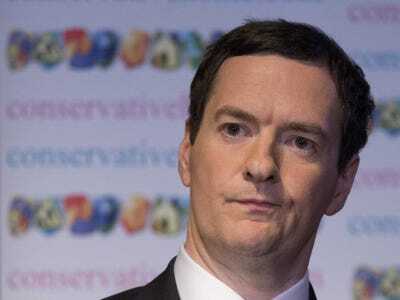 The government borrowed $US64.7 billion in the first 7 months of the year: £3.7 billion more than it did in the same period last year, a 6.1% increase and more than analysts expected. That’s despite the economy growing and the government’s official target to slash the deficit. So it’s fair to ask: is prime minister David Cameron’s government even really trying to cut public spending any more? 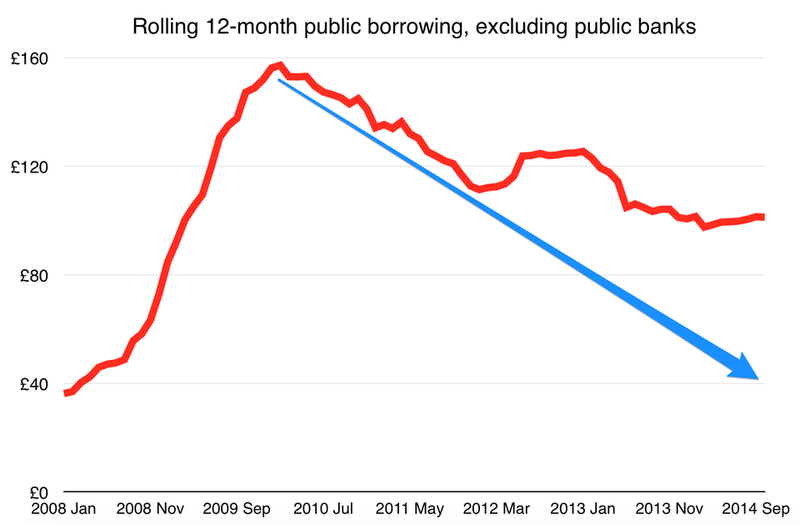 This chart (above) shows how much the government has been borrowing over each 12-month period, and how the trajectory might have been if chancellor or the exchequer George Osborne and the Treasury had stuck to its original pace. REUTERS/Neil HallChancellor George Osborne: not even trying anymore. It’s clear what happened: the government began with quite rapid spending cuts, but the direction of travel changed at around the beginning of 2012. Borrowing rose a little, and when reductions resumed, they were much steadier. The £101 billion borrowed in the 12 months to October is barely different to the £104 billion borrowed in the 12 months before that: at this pace the deficit would take about 35 years to eliminate. It’s now not clear that the government will hit its own targets for reducing spending this year, despite pretty decent economic growth. That’s in comparison to the US, where the public deficit has been dramatically reduced. By amazing coincidence, there is a general election next year. Governments tend to dislike enacting cuts right in front of a vote. This is all just loading up problems for the next government, and possibly the one after that. The public spending reductions pencilled in for the next parliament are huge, and every time figures like these come out, they get a little bit bigger.